If drinking alcohol, even in small quantities, gives you food allergy symptoms such as flushing, itching, or odd digestive problems as opposed to hangover symptoms, you may have an allergy or an intolerance to alcohol. Although true allergies to ethanol (the scientific name for alcohol) are rare, alcoholic beverages can include a number of different ingredients that can cause symptoms of allergy or intolerance. This can be a problem if all you want to do is grab a drink with friends. There's some good news, though: While some of these allergies may require you to quit drinking entirely, there are workarounds for the others. Here is information on the potentially problematic ingredients found in various alcoholic beverages, and what you can consider substituting for those drinks. Gluten, the protein that triggers celiac disease reactions, is found in three grains: wheat, barley, and rye. Malted barley is used to make beer and some other bottled drinks. Some beer also contains wheat (either in addition to or instead of barley). Therefore, if you have celiac disease or non-celiac gluten sensitivity, you'll need to steer clear of conventional beer. If you have a wheat allergy, you can drink beer that's made with barley but not wheat. It gets more complicated when it comes to alcoholic beverages that are made with gluten grains but distilled. Common distilled beverages that are sometimes made from wheat, rye, and barley include gin, vodka, and whiskey (including bourbon). The American Dietetic Association (ADA) considers distilled spirits safe for people with celiac disease. According to celiac disease dietary guidelines, unless flavorings are added after the distillation process, distilled alcoholic beverages are gluten-free. However, this is a controversial topic, since many people with celiac or gluten sensitivity do report reactions to alcoholic beverages distilled from gluten grains. Meanwhile, little research has been done on the effects of distilled spirits made from wheat on people with wheat allergy, but the European Food Safety Authority considers them safe. If you are concerned about consuming gluten-based alcohol, you can try a potato-based or grape-based vodka or a gluten-free whiskey made from sorghum (a gluten-free grain). Since the gluten-free commercial market has grown so much, many manufacturers make alcoholic beverages that are labeled as gluten-free. For example, there are a number of beers made entirely from gluten-free ingredients. Common alcoholic beverages that are naturally gluten-free include wine and most brandies. Do read brandy labels carefully, though, since some flavored brandies include sweeteners and additives that may contain gluten. Most liqueurs and some wine coolers are gluten-free as well. With any of these, it's wise to check labels or manufacturer websites since there are exceptions and some do include possible gluten-containing additives. Many foods, including aged cheese and red wine, are high in histamine. This is the same chemical involved in a number of allergic reactions in the body. An allergic reaction to high-histamine foods actually could indicate a possible histamine intolerance. Your body has two enzymes that are supposed to break down histamine, but sometimes these enzymes don't work as well as they should. When this occurs, it can cause a variety of histamine intolerance symptoms, including the so-called "red wine headache." There also is some evidence of histamine being associated with migraines. While red wine is especially high in histamines, all alcoholic beverages have high levels of histamine. Antihistamines like Allegra (fexofenadine) and Zyrtec (cetirizine) may help alleviate histamine intolerance symptoms. However, the best treatment is the avoidance of histamine in the foods we consume, including alcohol. Other histamine-rich foods to avoid include cured meats, spinach, tomatoes, and fermented foods like kefir. A group of sulfur-containing compounds known as sulfites occurs naturally in wine and beer, and they help inhibit the growth of harmful bacteria in those beverages. In addition, vintners sometimes add more sulfites to wines because they act as preservatives. However, in susceptible individuals, sulfites can trigger asthma attacks or a serious, all-body allergic reaction known as anaphylaxis. For most sulfite-sensitive people, very low amounts of sulfites do not trigger an asthma attack, but as amounts go up, so do the chances of experiencing a reaction. U.S. labeling laws require any food with sulfite concentrations greater than 10 parts per million (ppm) to be listed on the label using the term "contains sulfites." If your allergist has advised you that you are at risk of anaphylaxis due to a sulfite allergy, you will need to avoid wine. You would also need to carry an EpiPen to self-inject yourself with epinephrine (adrenaline) if the event of an emergency. There is no such thing as a truly sulfite-free wine. While organic wines are not allowed by law to include additional sulfites, some do include enough natural sulfites to be problematic for some asthmatic individuals. The type of yeast used to ferment many alcoholic beverages is a one-celled fungus commonly known as brewer's yeast. The scientific name is Saccharomyces cerevisiae, and it's the same yeast that is used to make bread rise. Allergies to Saccharomyces cerevisiae have been well-documented in medical literature and are most likely to occur in people who have mold allergies. 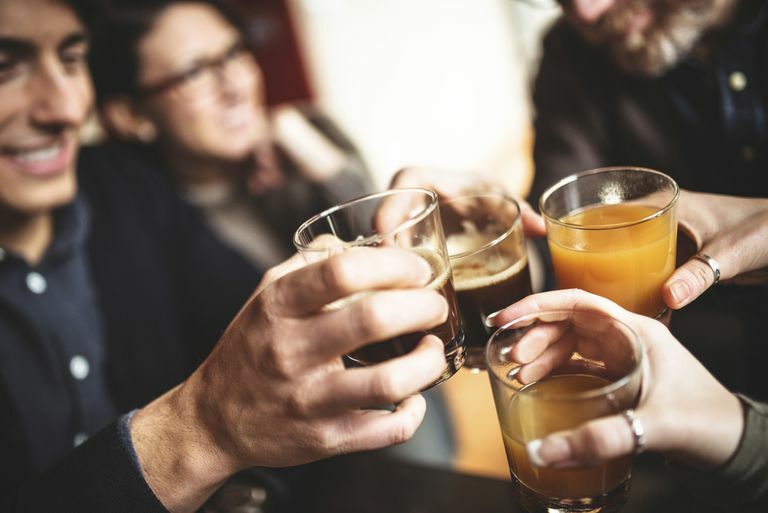 Brewer's yeast is used in all fermented alcoholic beverages—beer, wine, hard cider, sake, kvass, and other similar beverages—so individuals with yeast allergies should avoid these. The same may not be true for distilled liquor. To date, there has been very little research done on yeast allergies and distilled spirits. If you are allergic to yeast and would like to make these beverages part of your diet, you should discuss further allergy testing with your allergist. It's important to note that brewer's yeast isn't the same organism as Candida albicans, which some alternative health practitioners have speculated can cause everything from chronic fatigue to depression. While mainstream practitioners agree that Candida albicans can cause acute infections like thrush, most reject the theory that chronic candidiasis is responsible for widespread health problems. Grape allergies are rare, but they have been identified in the medical literature. In addition to wine, individuals with grape allergies need to avoid Armagnac, Cognac, ouzo, vermouth, port, champagne, most wine coolers, and packaged martini mixes. Some possible alternatives to wine and grape-based spirits include Japanese plum wine, which has a sweet taste somewhat like Moscato, and Calvados, which is apple brandy. To date, the question of whether distilled alcohol made from corn is safe for people with corn allergies (as other distilled grain alcohols appear to be for people with other grain allergies) has received very little attention in the peer-reviewed medical literature. A 1999 case study on a patient who had demonstrated corn allergies and anaphylaxis triggered by beer appeared to show that corn-derived distilled alcohol was safe for people with corn allergies. This case study was cited by the European Food Safety Authority in their position paper stating that distilled alcohol derived from corn was probably safe for patients with corn allergies, especially since scientists could not demonstrate the presence of proteins (the portion of corn that triggers allergic reactions) after the distillation process. However, given that the clinical evidence on corn and distilled alcohol is so scant, you may wish to talk to your allergist before adding corn-derived distilled alcohol to your diet. People with corn allergies should avoid alcohols derived from corn, most especially bourbon. Other types of liquor, including gin, whiskey, and some vodkas, may also be distilled from corn, so be sure to always check the label. While some beers are safe—they use non-corn cereal grains, water, yeast, and hops—many are not. Currently, U.S. manufacturers are not required to list ingredients on malt beverages (although some do). Wine is safe for corn allergies and intolerances, but Spanish chicha is another fermented corn-based beverage that should be avoided. One other potential area of concern may be flavorings added to liqueurs or brandies as these may contain corn. If the full list of ingredients is unavailable on the label, check the manufacturer websites or call customer service before drinking. Alcohol intolerance comes in many forms. If you have any type of food allergy, it's important to be very careful with the alcoholic beverages you consume. Label standards make it difficult to know what has gone into the production of beer, wine, and liquor. If you have questions, be sure to ask your allergist regarding your specific reactions and how you may be able to continue to drink alcohol. Why Do I Have Pain After Drinking Alcohol? Bansal RA, Tadros S, Bansal AS. Beer, Cider, and Wine Allergy. Case Reports in Immunology. 2017. Figueredo E, et al. Beer Induced Anaphylaxis: Identification of Allergens. Allergy. 1999;54(6):630-34. Jaeckels N, et al. Assessment of Sensitization to Grape and Wine Allergens as Possible Causes of Adverse Reactions to Wine: A Pilot Study. Clinical and Translational Allergy. 2015;5:21. doi: 10.1186/s13601-015-0065-8. Kelly CP, Lamont JT, Grover S. Patient Education: Celiac Disease in Adults (Beyond the Basics). UpToDate. 2015. Krymchantowski AV, da Cunha Jevoux C. Wine, and Headache. Headache: The Journal of Head and Face Pain. 2014;54(6):967–975.